Nintendo is enjoying its best year since the heydays of the Wii and DS consoles. The games firm has just announced its latest set of financials which nearly double the expected profits for the current financial year. The good news stems largely from sales of the Nintendo Switch, which have started now to flow, as supply wrinkles have been largely ironed out. Talking numbers, the Switch has helped propel Nintendo from an expected 65 billion yen ($572 million) profit to an expected 120 billion yen ($1.06 billion). Nintendo released the Switch in March, and couldn’t ship enough devices to sate demand worldwide. 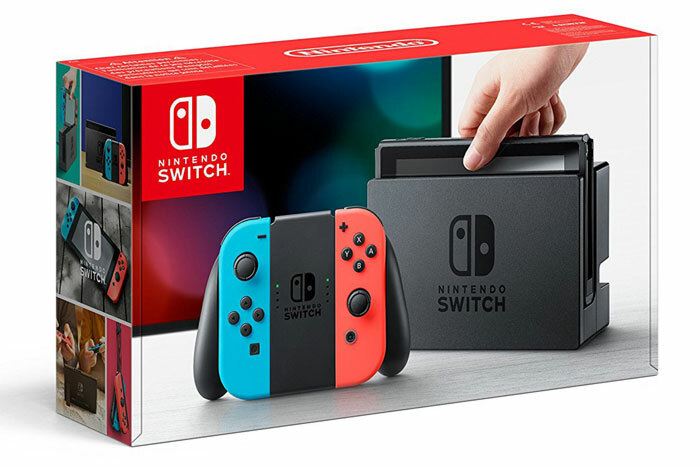 Now manufacturing is stepping up and Nintendo expects to sell 14 million of the consoles to the year ending March 2018 – previous forecasts had pegged the expected unit sales figure at 10 million. 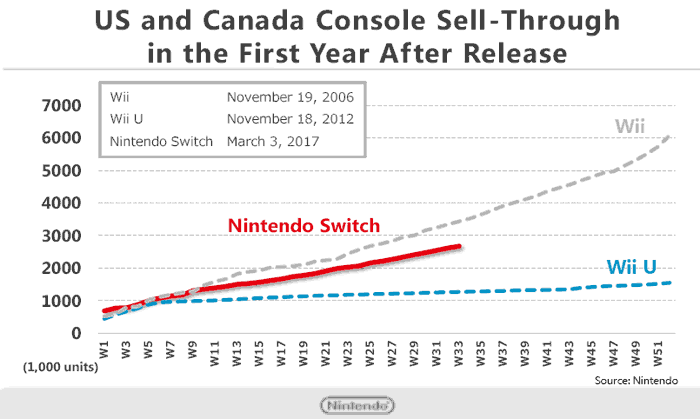 In its financial presentation Nintendo was keen to draw parallels with the sales performance of the Wii (the popular console which launched in 2006). Looking at either the US or Euro charts in the presentation you can see the Switch follows the Wii much more closely than it does the Wii U. Furthermore, Nintendo emphasised that the Switch hasn’t had a ‘holiday season’ yet. It was only launched in March this year. With the holiday season sales quantities in Nov and Dec Nintendo thinks the red line (see above) will cross above the Wii sales performance chart. So far 7 million Switch consoles have been sold and there are 300 software publishers working on Switch titles. Nintendo wants to maintain the buzz ahead for Switch owners and those interested in the platform. It looks set to continue the strong first party releases. Last Friday saw the release of Super Mario Odyssey has been gaining phenomenal reviews in the gaming media and positive comments on social media. So far Super Mario Odyssey has sold 2 million copies in just 3 days. Similar to its upward estimate for console unit sales, Nintendo reckons 50 million Switch games will be sold, rather than the previous estimate of 35 million. On the topic of software, Nintendo’s first mobile game, Super Mario Run, broke an Apple app download record and Nintendo is looking to follow up with a version of Animal Crossing. Finally, let us not forget Nintendo's recent successful outings in retro gaming mini consoles.